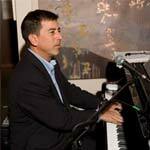 John Brackett was raised in Virginia and started playing piano at the young age of 5 years old. His instrument in High School and College was trombone. He graduated from Brevard College and studied music at William and Mary. He played at various Jazz Clubs in the Washington Area. In 1989 he moved Hilton Head Island, where he was the featured band at Big Rocco's for 9 years. His band was all the rage at the Blue Night Club for 4 years and then on to the Jazz Corner for 6 years. John is now is a full time photographer and I feel always excited when he is available to play. John usually plays with Bass and Drums and Saxophone as a fourth piece. He has a wonderful voice as well, and has the style and Sound of Harry Connick Jr. A wonderful talent.